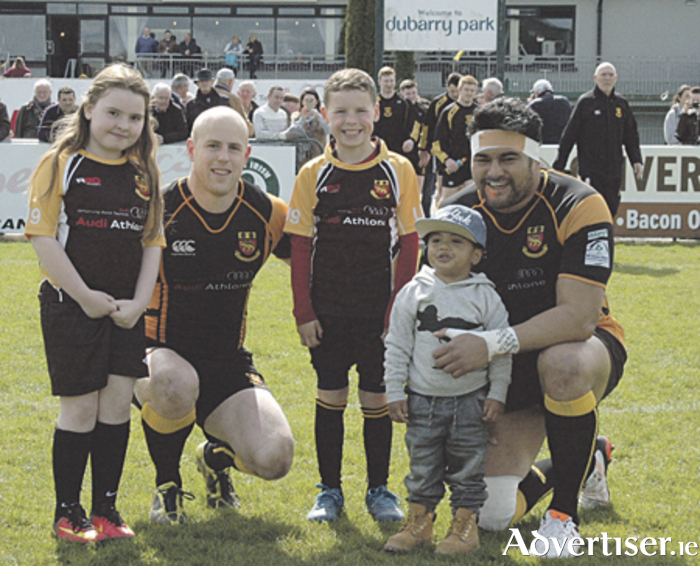 Buccaneers finished up their Ulster Bank League Division 1B title-winning season with yet another bonus point victory at Dubarry Park on Saturday, but their 40-10 win over Ballynahinch was not as clearcut as the scoreline suggests. Depleted ‘Hinch had proved awkward visitors and stubbornly held on to a 10-7 lead as the game entered the final quarter. Then the Pirates finally unleashed their scoring potential as the depleted northerners ran out of steam and Buccs added five tries in that late scoring salvo in this Ganly’s of Athlone sponsored match. The champions had two personnel changes for this game, U20s Frankie Hopkins and Luke Carty coming in to form a new half-back partnership. Shane O’Leary switched to centre in place of the injured Mata Fifita, while Conor McKeon was not available. Meanwhile, the number of players used by Ballynahinch in this campaign rose to 57 as they made four changes with Andy Simpson and Garreth Gill starting in their pack and Jordan Grattan and Ryan Wilson coming in to their backline. The Ulster side had first benefit of the breeze, but Buccs struck for the opening score after 17 minutes. Following an off-the-ball tackle on O’Leary, Buccs punted a penalty from the visitors’ 10 metre line to touch on the right. There Danny Qualter won smart lineout possession and the Pirates pack drove over the Hinch line, where Jamie Dever grounded the ball for his first try for the homesters. O’Leary added a fine conversion and Buccs looked on their way. Ballynahinch had other ideas and a swift retort yielded a brace of quickfire tries. Aaron Cairns wove his way through just before the end of the opening quarter and, just three minutes later, a quick throw-in to Peter Nelson enabled the outhalf to send David Nicholson scampering away from his own half to touch down. Neither try was converted, but the Mourne men had their noses 10-7 in front at the end of a generally uneventful first half. Buccs introduced Alan Gaughan and Shane Layden for the second period and were more forceful following the change of ends. However, prop Dever was yellow-carded five minutes into this half for not rolling away and Hinch doggedly defended their slim advantage. But Buccs pressure was slowly building and Rory O’Connor made a lightning break down the left flank where his link with Hopkins drew a high tackle by Blane McIlroy before the home scrumhalf could offload to the supporting Jordan Conroy. McIlroy was duly sin-binned and Buccs added further punishment when, following the penalty to touch in the left corner, the Athlone pack mauled their way over the Hinch line to regain the lead with a 63rd-minute John Sutton try. Three minutes later Gaughan made a terrific break from midfield, but Nicholson put in a try-saving tackle just five metres out. However, the ball was niftily transferred via Layden to O’Leary who touched down to the right of the uprights. This Buccs scoring blitz continued when Kolo Kiripati broke away with the ball and possession was promptly skipped across field for Conroy to touch down for a bonus point 70th-minute try. Gaughan converted the three tries, all scored during McIlroy’s absence. Buccaneers grabbed another brace in the final moments. Rory Grenham powered over for a 78th-minute try on the right, with Kiripati’s conversion attempt going narrowly wide. In the dying moments, Layden surged through to score a final try, enabling the talismanic Buccs skipper Kiripati to bring the curtain down on his time with the club by landing a conversion to complete the 40-10 scoreline.